Metal maniacs, rejoice! 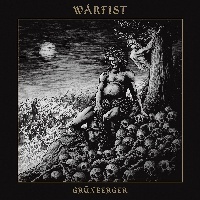 I am proud to present to you: WARFIST; signed via Godz Of War Records, hailing from Polish grounds - performing Blackened Thrash Metal, on their 3rd album entitled: “Grünberger” (released 27th February, 2019). Since formation in 2004; the band in question have 2 Demos, an EP and 5 Splits in their discography so far. I am introduced to their sophomore album entitled: “Grünberger”; 11 tracks ranging at around 37:18, WARFISTarrange an intricately designed formula of heavy-hitting Blackened Thrash Metal developments. “Black Army” begins the record; conveying amplified adrenaline, amalgamated into a barraged frenzy of boistrously bouncy chugs and gallops – chaotic characteristics and meticulous mayhem. Adroitly attributing crunchy creativity; catchy deadliness, and concretely gritty flamboyancy - implementing hasty harmonics with fiercely composed melodies - manifesting ominous onslaughts of relentlessly rhythmic stampedes, rampaging stomps of quintessential persistency and prodegiously wonderous wrath. Consisting of Mihuon the vokills (vocals) and stringripper (guitar); the frontman consistently contrasts with an abundantly distinctive influence to that of TOXIC HOLOCAUST, “The Chapel Of Death” complexly blends blistering aesthetics – demonstrating diligently dextrous deadliness in which executes Joel Grind’s trademark substance remarkably well. Also distributing profusely robust riffs and solos, that thunder with progressively technical ramifications. “Feasting On Dead Bodies” lacerates with rip-roaring shreds; solidfied with strikingly primitive performances, recitified with remedies that ultilize versatile variety with vehement velocities that slam with poundingly thrashing malignance. Audible bassist and battering drummer Pavulonhammers his arsenal with grooved hostility; frolicking frantically, fuelled up hymns - hardened with sonic steel. “Burning The Flames Of Ignorance” establishes efficiently electrifying experimentation; enlightened distinguishes characterized with constructive finesse, embellishing on detailed inventivity. Enforced fulfilments also include creative carnage; diversely killer juxtapositions, pursuited with rapidily swift nimbleness and jumpy thumps that organically showcase salubriously pummelling effectiveness. “Slay, Swive And Devour” injects dosages of infectiously meticulous savagery; supplying sinisterly vicious subjugations of ritualistic silver lining firepower and expertise. For a couplet duo; WARFISTexcel into an extreme charge of conceptual warfare, immersely dynamic intensities and proficiently prominent foundations of borderline malevolence – meaty weight and speedy stability. “The Punishment” provides more lethal boosts of fluidly polished systematics; razor-sharp sound production memorability, and original songwriting skills that transistions to wildly rushing screams of vengeful virtuosities. “Death By The Cleansing Fire” attributes catchy contributions; captivated into elegantly enjoyable instrumentation, infused also of adaptly adroit artistry – musicianship triumph & talented techniques. Engaged on punctilious results; rambunctious terror, and unprecedented yet unique vitality of rumbling roars that portray rawly rough gnarliness. “Grünberger (Drinking With The Devil)” establishes snappy remorse; melodiously monstrous mid-tempo sections, behemoth demonizing of hellish havoc and destruction - coverged into orchestral pandemonium. “March Of Death” generates deep, guttural growls of enjoyably doomy entertainment – representing riveting rage, mordernized and methodical stimulations that storm with remarkable replayability value. Overall concluding “Grünberger” with the finale song: “Atrocious Saviour”; I am compelled to say that WARFISTcertainly outdone themselves with this one, and it definitely exceeded all original expectations for sure - all fans of Metal and in particular, this sub-genre – will relish this record with strong might, recommended - most definitely.